She's laminated her spiral-bound book... added pages of specialty stitches, all kinds of stuff. Karen never does anything little! Here are 4 other new samplers available in 10 and 20-page booklets. You can't see enough detail on these bitty pics... they are just teasers, aren't they? By The Numbers is NOT alphabets - it's NUMBERS! Float your mouse over each image so you know its name and then click them to see larger pics. THIS IS AMAZING! 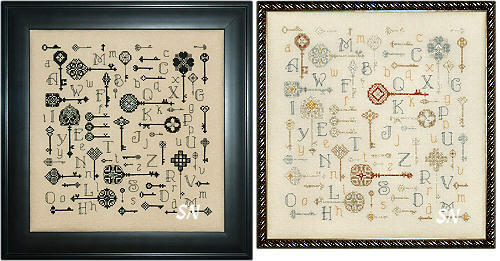 Rosewood Manor has designed a 499 x 499 stitch count piece that - as you can see - contains 101 different alphabet fonts!!! 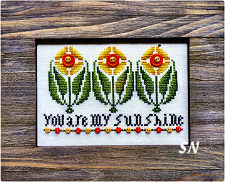 Finishing approx 36 x 36 on 28ct... it is charted for 29 shades of DMC floss. The actual pattern leaflet is 58 pages... and my goodness... if you can't find an alphabet in here that your project needs, it doesn't exist! Karen says she's been working on this off and on for the past 10 years, and finally committed to finishing it! Great motifs and borders tucked everywhere... it is such a delightful array of different letter styles. You can get a better look at this by clicking through to the Rosewood page and then clicking on the image. 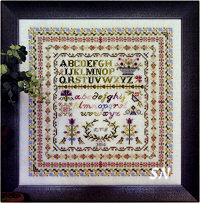 Stitch a small section, or use pieces and parts - the alphabets in here provide you such a stitch resource. An encyclopedia of fonts! We're always after Karen of Rosewood Manor to design us some smaller designs to complement her many large ones. We have 11 of the results!!!!! 1/2 Sized charts - clear and pretty color pics on the covers, nice and large charts on the inside. Each of these comes with its hand-dyed floss from South Africa (!) or bunches of little hand-dyed buttons from Just Another Button Company (from IL!). Most are done on Antique White fabric... lots of fabric options with that! Make sure to scroll down this page to see the other 7 designs! 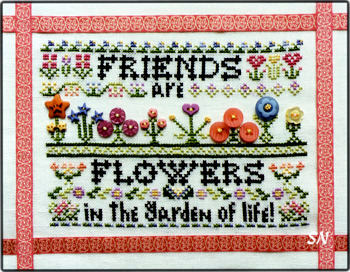 Friends are Flowers *In the garden of life. 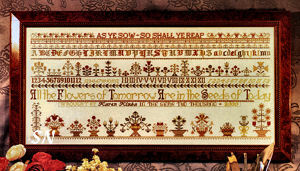 * The included buttons make up the line of blooms... the measures 95 x 68 and is coded for DMC. Friends are Like Flowers - *You can never have too many. 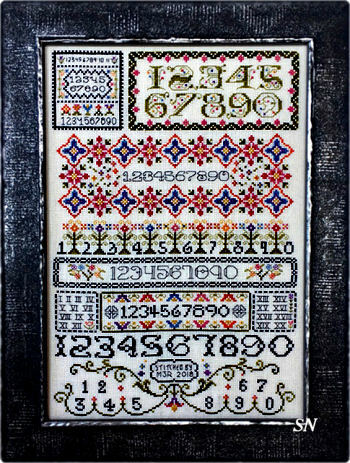 * Measuring 95 x 119 (fits and 8 x 10 frame on 28ct), this one features hand-dyed flosses from House of Embroidery in south Africa! Soft honey, denim, light grass green, a raspberry and hand-dyed browny-greeny... kind of a Dutch feel to this one! 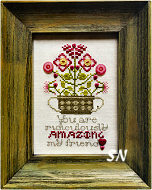 Amazing Friend - *You are ridiculously amazing, my Friend! 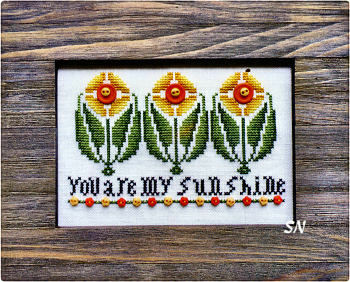 * Another smattering of cute buttons to make up the pattern, this one measures only 51 x 77, so it'll fit a 5 x 7 frame. The 4 Seasons all done with baskets of flowers and some 'busy-ness' in the backgrounds. These all measure the same 96 x 64 in stitch count. 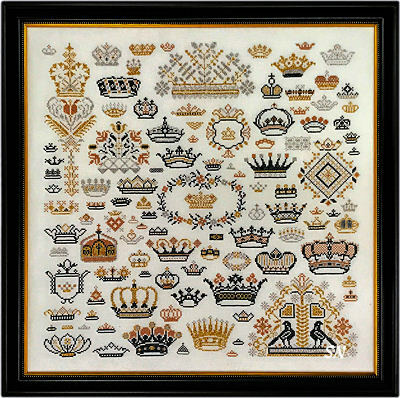 Choose a 16 or 32ct Antique White fabric; these are all worked with their 5 colors of hand-dyed floss from House of Embroidery of South Africa. I think the Summer and Autumn are my favorites... I love the profusion of all the background stuff!!! Sunshine, A Star, Neighbors... Buttons Everywhere! You Are My Sunshine - bright greens and oranges... just sweet, bold, and balanced! 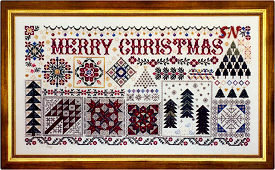 Measures 83 x 51 in stitch count - fits into a 5 x 7 frame. 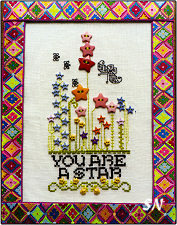 A Star - This one is darling!!! You get about 40 buttons in here, and they make up all the floral buds and flowers in the design. Fits into a 7 x 9 frame. 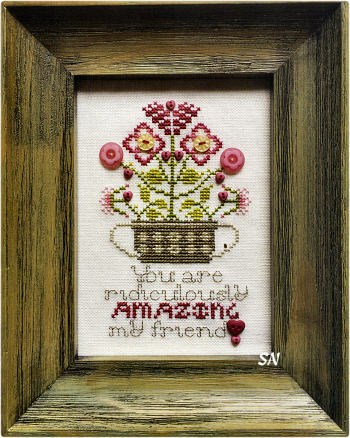 Neighbors - This one features about 30 tiny raspberry-colored flower buttons that you see stitched into the border. The stitched piece measures 96 x 67 (around 7 x 5). Karen is showing it with patterned ribbon as kind of a 'mat' finishing treatment. Time to get started on this one if you want it for next Christmas! 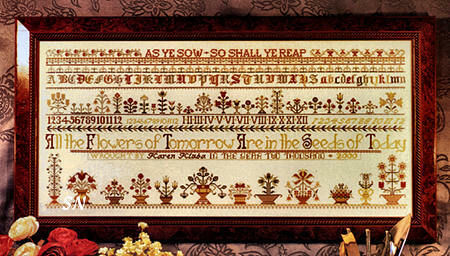 Rosewood Manor's newest piece, this measures 298 x 159 in stitch count and will finish approx 19 x 10 on 32ct. Worked in Weeks Dye Works hand-dyed flosses, it uses Rainbow Gallery's Petite Treasure Braid for it's metallic gold accents. Karen has lots of smaller designs in here that will make pretty ornaments -- just in case you don't have enough stitching hours in the day to get this entire thing finished! Deep and rich colors, it is very eye-catching! 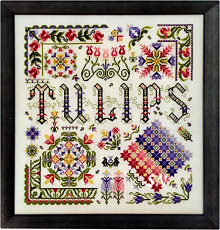 Karen is a tulip-lover, so designing this piece came easily to her. Stitched in regular DMC flosses, the colors are so brilliant and pretty! She talked about hiding tulip motifs throughout her design in her publicity blurbs... I cannot find them in here!! 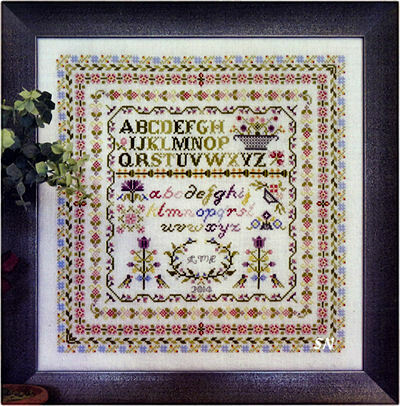 The sampler is very pretty; I like all the broken border corners! 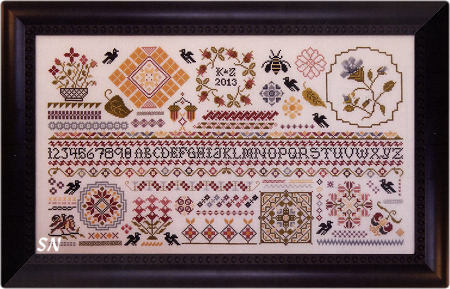 Stitch count is 198 x 208, but there are always lots of smaller areas in Karen's charts, and this one is no exception! 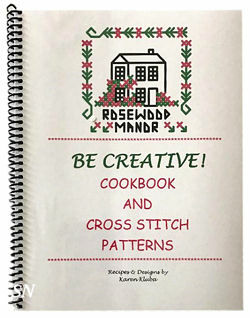 Rosewood Manor has several new releases -- this is one of my favorites! 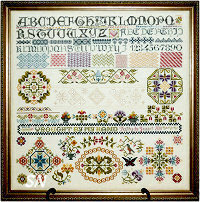 All the pretty motifs all organized so beautifully inside their sections, it is full of antique-y, soft color. Stitched on Weeks 32ct Parchment Linen with 18 different shades of Weeks hand-dyed cottons, it finishes approx 19 x 13 and is just stunning. 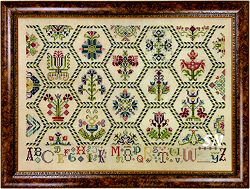 Each section has a pretty stylized floral -- notice that all those on the edges can be flipped to create more whole motifs. 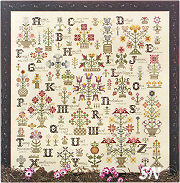 Do the pretty alphabet all by itself and add the 'leaf' border around it... or leave it off completely! 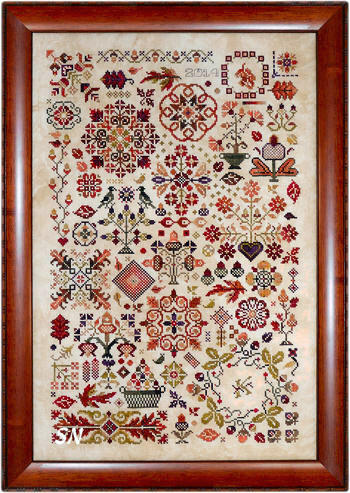 Any of the florals would be stunning over one on something little for a fob or needle case cover (they measure about 45 x 45 stitches each.) Very traditional, balanced and striking! 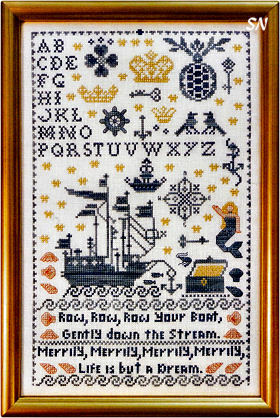 Karen designed this as a possible baby announcement sampler! Worked on 28ct White or Antique White Lugana, she has mounted it with a piece a gold lame' fabric on the back -- so that the gold metallic 'peeks through' the Lugana. Everything is stitched with Rainbow Gallery's Petite Treasure Braid -- a very nice, soft metallic thread -- you use only one stand and do not separate it. 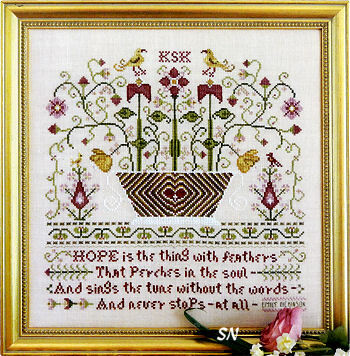 *Hope is the thing with feathers that perches in the soul and sings the tune without the words and never stops at all. * A poem by Emily Dickinson supplies Karen's words for this design . 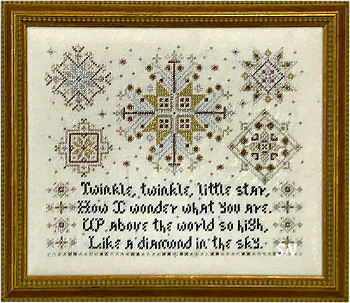 Lovely and uplifting, this finishes approx 10-1/2 inches square on 32ct Weeks Parchment Linen. Multiple skeins of just 8 different shades of Weeks hand-dyed cottons are used as well. 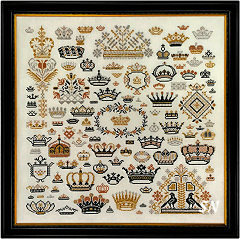 A companion to *Crosses* this is another medley of dozens and dozens of different crowns you might find in antique samplers. Stitched entirely in Rainbow Gallery's metallic Treasure Braid, there are 4 colors of thread in this, and it finishes approx 15-1/2 inches square on 32ct linen. Might be kind of fun to add some beads to some of the crowns... you could also make some small ornaments. Here's a possibility -- change some colors -- choose just one or two crowns and make them bright pink and green to adorn a bedroom sign for a little girl! Here's an oldie but goodie! 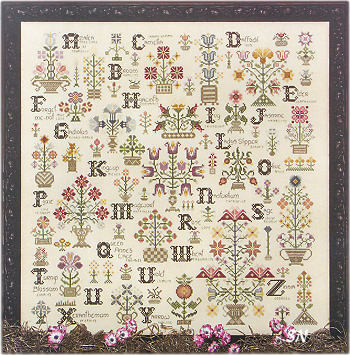 Published in 2004, this features 26 different flower urns -- make 26 different pin cushions to nestle in a basket, and forget the alphabet letters! But then, the cushions might be fun as alphabet cushions! 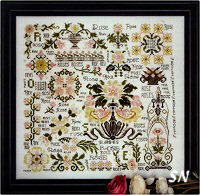 The stitch count is 200 x 200, so the whole piece finishes approx 12-1/2 inches on 32ct. Individual cushions could be 50 x 50 -- Karen supplies a border for that purpose... so they could finish 3 or 4 inches in size. Companioning several other Rosewood 'flower' books... this is a pretty medley of nothing but different daisies. Finishing approx 12-1/2 inches on 32ct... it is coded for Weeks hand-dyed flosses. Just very pretty! 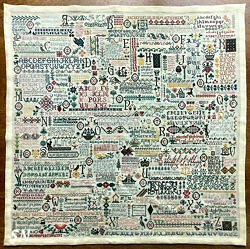 Karen is intrigued by Quaker Motifs, so here is a sampler full of only that! 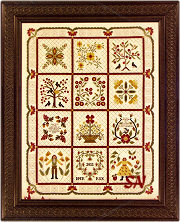 Measuring 21 x 14 on 28ct... you could choose 36 and it'd be 16-1/2 x 11... it has simple cross stitches -- no special stitches. The colors called for are DMC 924, 926, 927 and 928. You can change those to any you like OR choose one or two hand-dyeds instead -- this has lots of potential. Consider changing out the alphabet letters for family initials and hide special dates all over on here -- like birthdays and weddings! Make it a family sampler. 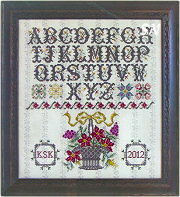 Karen Kluba has designed a sampler featuring flower baskets. Just about Millions of tiny flowers in here... this finishes 12 x 18-1/2 on 28ct Picture This Plus Wren Linen, and is worked with super-colorful Valdani hand-dyed flosses. Just yummy, as all of Karen's samplers like this are! Leaflet comes with the Valdani flosses. Ships and a mermaid... this is done with Weeks flosses of Conch, Cadet, Twilight, Deep Sea, Clockwork. It calls for a gold silk lame' thread... so you could sub gold metallics or cottons too, if you'd rather. Finishes approx 8 x 13-1/2! 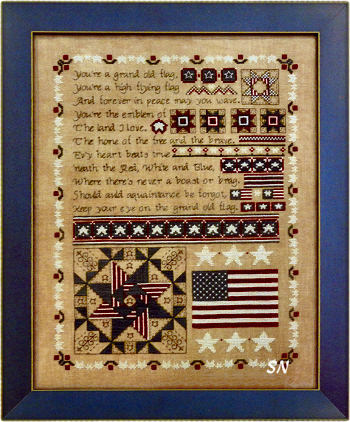 Rosewood Manor has several new designs -- everyone LOVES her patriotic ones -- so I chose this one to feature on Just Arrived! 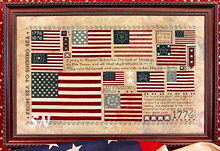 Did you know that Karen donates 10% of her sales of her patriotic designs to Wounded Warriors? 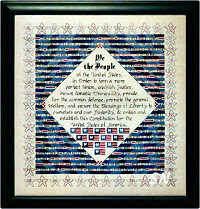 Featuring the Preamble to The Constitution in the center, Patriotic Quilt showcases the names of all who signed the Constitution, and the states they represented. Really a neat piece, it is stitched on Weeks 32ct Parchment linen and finishes approx 13 x 13. It's coded for Valdani hand-dyeds and Rosewood has bundled ALL the Valdani flosses together for you! GORGEOUS colors -- you get 2 skeins of a creamy, 1 skein of a deep red, 1 black, and 4 skeins of the prettiest blue medley! 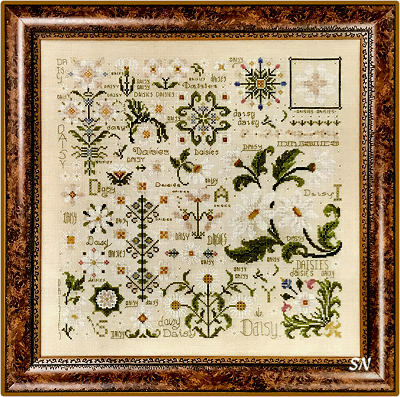 This piece is coded ONLY for Treenway silks (luscious!) -- which we have packaged just for it. 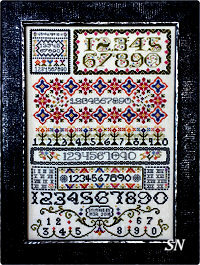 Stitch count is 298 x 188 -- so it finishes approx 18-1/2 x 12-ish on 32ct. Presented as the leaflet, the silks are separate. Here's another pretty floral band sampler -- only the bands are running vertically instead of horizontally. Coded for Sulky silks -- this uses only 6 colors. It calls for Sulky brand Cotton threads. The official Rosewood package contains the pretty deep salmons, gold, green, and 2 spools of hand-dyed -- which is a medley of all the solids! Stitch count is 168 x 191 -- so 10 x 12 on 28ct. Here's a multi-part design that really makes a statement in it's entirety, and offers TONS of design options if you split it up!!! Look at all the smaller squares -- cushions and fobs galore! 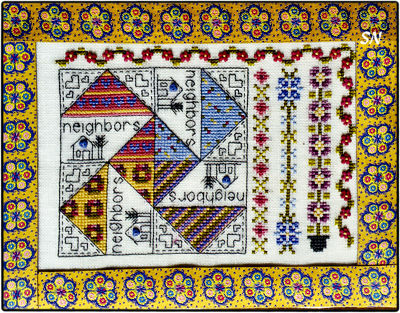 The central basket design is cool -- Karen has divided this up into 16 different sections, and printed the backstitching in red to make it all easier to navigate. Finishing 7 x 20 on 28ct... it's tall and skinny! 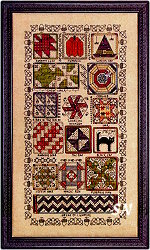 Charted for 32 colors DMC -- you'll need 3 skeins of black for the backstitches! 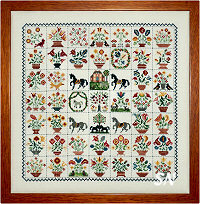 Wow... this pattern is stuffed with creative options and wonderful, miniature quilt blocks! 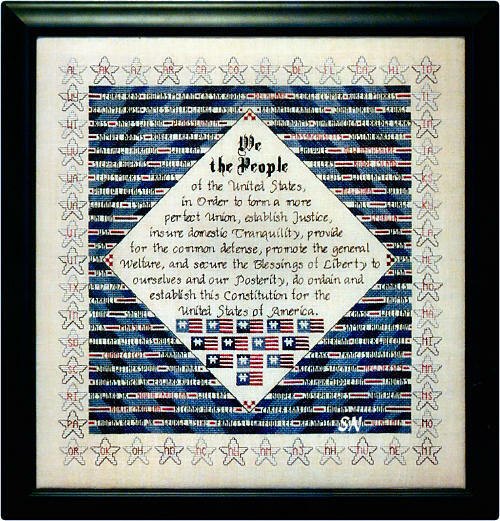 Words from The Pledge of Allegiance, and 51 little 1-1/2 inch blocks all make up the American Flag. The first 13 states are in the blue section, and all the rest are in the stripes area -- arranged in the order the states were admitted to the Union! Very clever and creative, there is a lot you can do with this! (Even adding special stitches would be fun!) 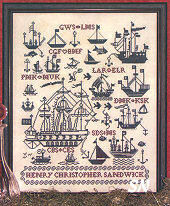 Offered as a leaflet, the main piece measures approx 18 x 24 on 28ct linen. So neat! An old verse -- apparently around in the 1800's - you might know someone who needs this reminder! If not, then maybe the office lunchroom???! It does make you smile. 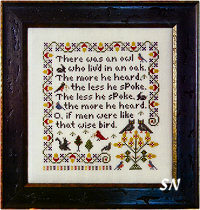 Presented as a leaflet, it measures just 100 x 110 stitches -- so approx 8 x 8 on a 28ct. Like Charming Tulips, this is a gorgeous study in stylized roses. 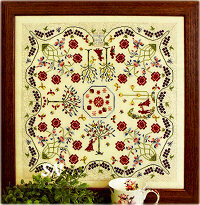 Borders, vines and motifs, everything is scattered very neatly into this 198 x 198 piece. Charted for Weeks Dye Works flosses -- you will need multiple skeins of several of the colors called for. What a pretty piece! 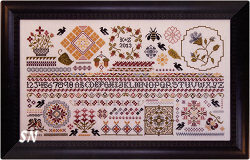 FIVE delicate borders - none of them too big and heavy -- surround the middle sampler which is pretty all by itself! I love the colors, I love the simplicity and straightness of the borders. 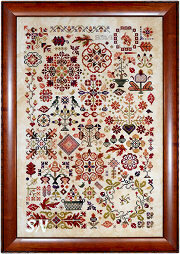 Charted for regular DMC floss, this has a stitch count of 199 square, so it finishes approx 12-1/2 inches square on 32ct. The shading of the green letters is regular floss -- not hand-dyed! Another really fun and different piece, this measures 194 x 110 and is full of floral urns of every shape and size. Every one of them is charming -- they'd make such cute fobs and cases. Do all these individually and finish them all with MOSSY hand-dyed chenille trim from Lady Dot Creates... or mix up the chenille colors... and display them all in a basket together! None of them are too involved, so they'd be so pretty all mushed together in a pretty basket! LOVE, LOVE, LOVE this one! 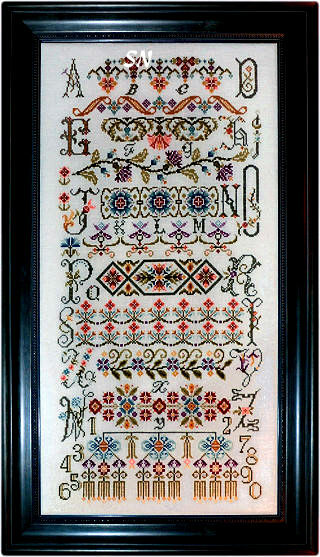 A pair of matching samplers, the big floral motif at the right and left are reversed, but everything else these two share is divided by that middle vertical band. Down in the greened and shady bed a modest bluebell grew. It's stalk was bent it hung it's head as if to hide from view. And yet it was a lovely flower, it's colors bright and fair. It might have graced a rosy bower instead of hiding here. Karen was thinking of the blooming bluebells in England! 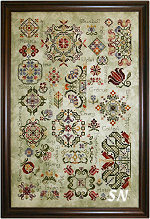 Offered as a leaflet, definitely soft, dusty shades of DMC floss, this measures 268 x 166 -- so finishes approx 12 x 19. Rosewood Manor has a cool new piece that she is using as a fund raiser for the Wounded Warrior Project! Worked on Weeks Dye Works Cocoa 36ct linen... choose something a little whiter or browner if the yellow in this isn't your favorite look. 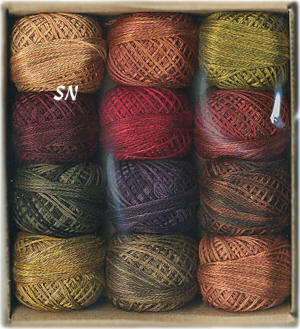 You'll need 4 skeins of Weeks Linen, 1 Gunmetal, 3 skeins of Bordeaux and 5 skeins of Deep Sea! Only the 4 colors in this 157 x 213 piece... there are lots of small sections in here that you can divide out into smaller projects. 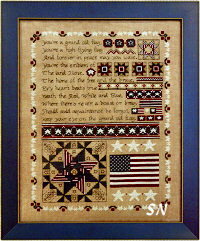 Something neat for a family room... offered as a leaflet, 10% of the sales of the charts go to Wounded Warriors. Rosewood Manor has exploded with four gorgeous new designs... 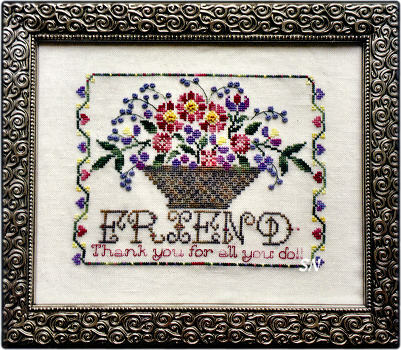 I have absolutely no idea how Karen designs so many pretty -- and generously sized -- pieces, and gets them FINISHED! The last in her 4-Seasons set, like Winter, Summer and Spring, each piece is stuffed with Quaker motifs and stitched with a fantastic selection of 16 balls of hand-dyed Valdani hand-dyed flosses made in Romania. Worked on 28ct Doubloon Linen (a nice, light, neutral beige) from Picture This Plus, the 170 x 270 pattern is NOT coded for DMC floss, but I imagine that your stash has some pretty threads that might work if the Valdanis are not your favorites. Can you see all the leaves and acorns in here -- they are everywhere! Offered as the leaflet with threads and fabric separate. 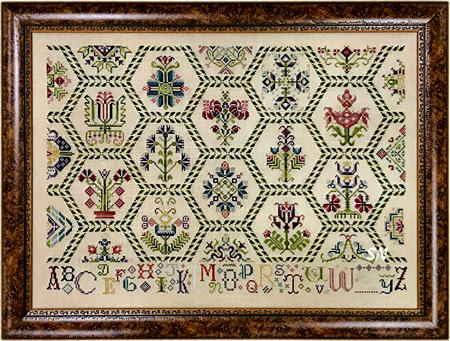 This is full of stunning border designs -- 12 of them -- and can you see the alphabet kind of hidden on the two sides? Use those letters for individual pin cushions or things like that... just beautiful -- you can use bits from all the borders to embellish those letters as well. 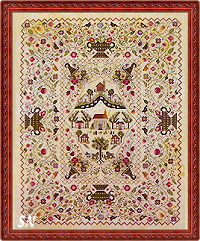 Lots of charming floral motifs, the borders themselves are involved, and VERY unique! Stitch count on this is 158 x 335, and it is coded for regular DMC floss. 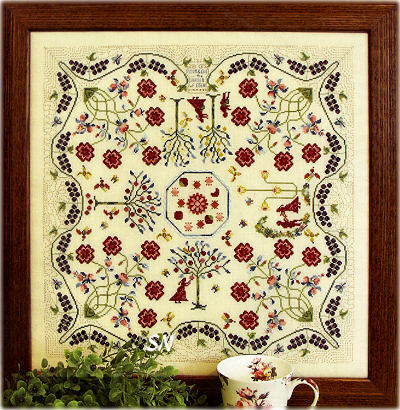 There are some Algerian Eyelets tossed around in here... execute them, or leave them out... the personality of this piece is set by all those gorgeous floral borders. Worked on 32ct Antique White Belfast linen, it finishes approx 10 x 21! This is a stunning piece! It offers that bold basket in the center -- which is worked on only 2 colors of Weeks flosses. The flowers are abundant... and the surrounding border is just amazing. Look at all the motifs -- they are all halves! Karen has arranged all of them into that organized and intricate border. So pretty -- you'll need multiple skeins of Weeks flosses -- 3 Pamlico, 2 Molasses, 5 Bullfrog, 6 Grasshopper, 3 Whiskey and 8 Cayenne! This finishes approx 18 x 18 on 32ct, so our fat third yard cut is the most economical way to go fabric-wise! Or whatever colors you like best! Choose a pretty fabric and grab 11 skeins of your favorite hand-dyed floss... and stitch this lovely monochromatic creation. 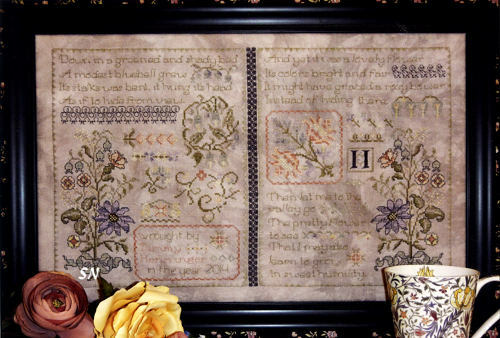 The alphabet side is 'cleansing' while the floral motifs on the right are super busy and intricate. Some of them would make pretty pincushions with one initial on the opposite side! 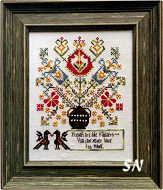 Offered as the leaflet, this measures 300 x 158 stitches. 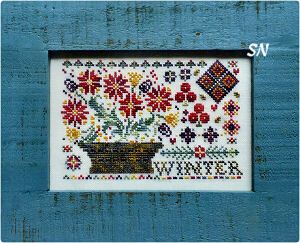 Rosewood Manor has her third seasonal Quaker Sampler ready -- we're still waiting on Autumn. All offered as leaflets, each of these call for Valdani hand-dyed floss, and are not coded for any other brands of thread. 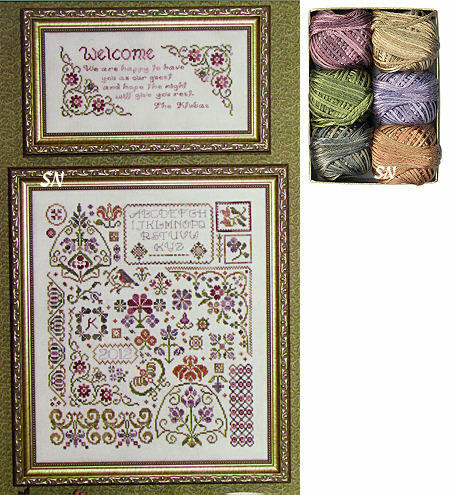 The featured fabric has a rose hand-dyed undertone... and the threads are a strong mix of greens and berry reds. 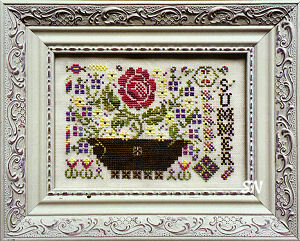 Summer finishes approx 12 x 19 on 28ct and is full of cheerful color. Offered as a leaflet -- threads are separate. The model is on Antique White -- but what would a deeper-in-hue hand-dyed do for it? 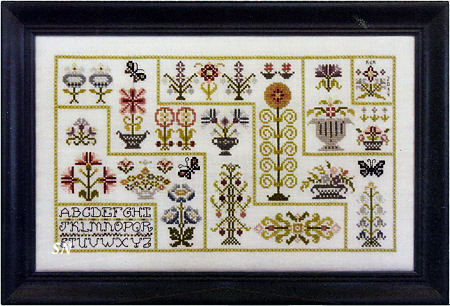 A truly lovely collection of corners and single motifs... picture one stitched on a tiny scissor fob! Offered as a leaflet. 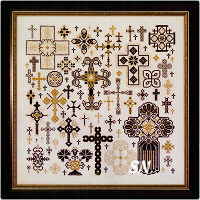 Such a neat medley of crosses of every size and shape... gold and black are your colors. 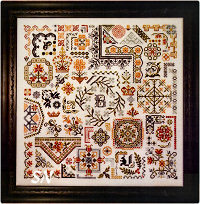 Worked on 32ct Antique White linen, this finishes approx 12-1/2 inches square. It'll be stunning with black and gold metallics added. Karen has even added a chart in here that says Welcome to our Church. Lots of possibilities with this one! Karen brings us a sampler that is stuffed full of Quaker-inspired motifs -- with tiny cardinals tucked between them everywhere! 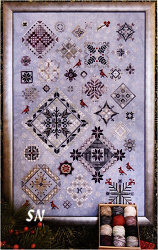 Stitched on 28ct -- you might want a dusty winter-y gray color -- she has worked this using Valdani hand-dyed flosses. 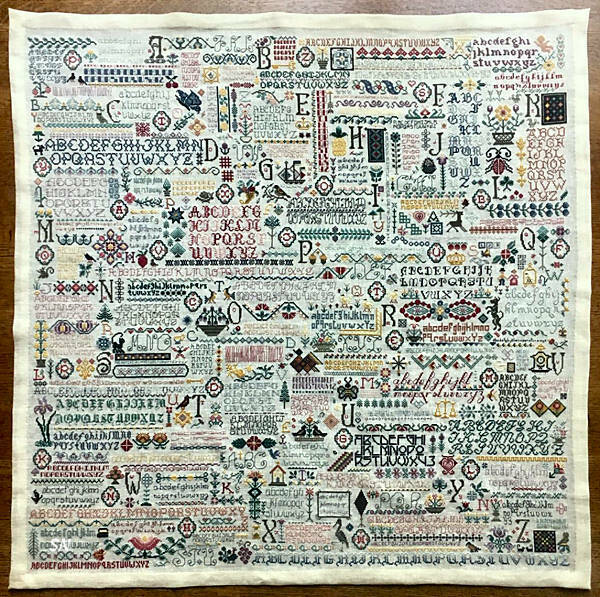 (no DMC coding) A companion to Spring Quakers, it's a lovely piece that CAN be stitched a little smaller if you don't have time to fit everything in here. 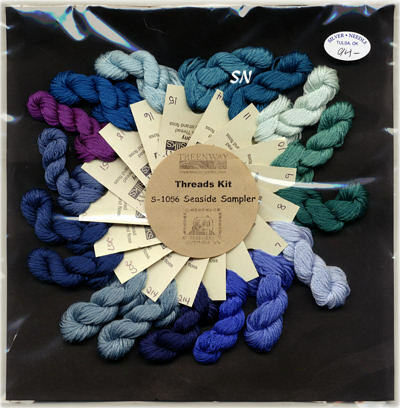 The Valdani threads are pictured on the leaflet cover -- a pretty set of 12 balls -- red, 5 blues and greens, a trio of dusty purples... great, winter colors! 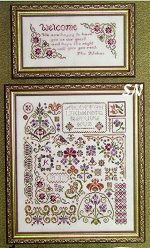 Offered as the leaflet with cotton set. Be sure to see Karen's other new designs below. 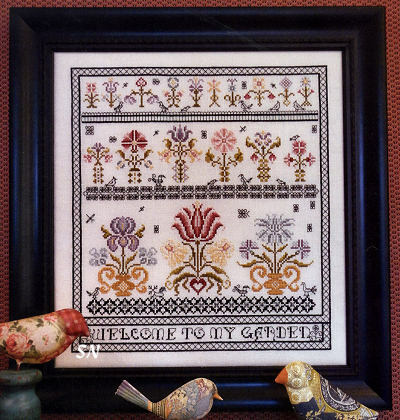 This is a pretty piece -- lots of Quaker motifs in here, along with birds and that cute bee. The stitch count is 298 x 166, so it'll finish approx (a huge) 21 x 12 on 28ct! DMC coding, the colors look bright -- lots of roses and golds, with yellow-greens -- easy to change-up if you decor features darker, more subdues colors. Offered as a leaflet. 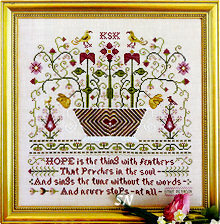 Inspirations to Karen by William Morris this has a stitch count of 100 x 338. 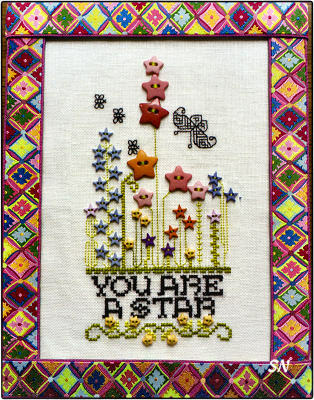 Coded for DMC, she has taken 4 of the main sampler motifs and added small borders to them -- giving you ideas for pin cushions and needlebook covers. 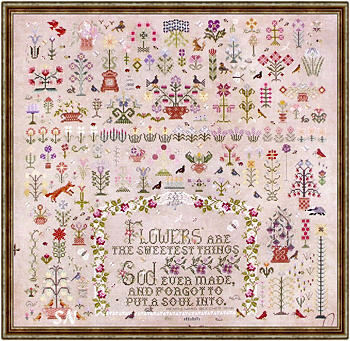 Urns and urn of spring flowers... 19 in all... just a pretty collection of softly shaded sampler motifs! 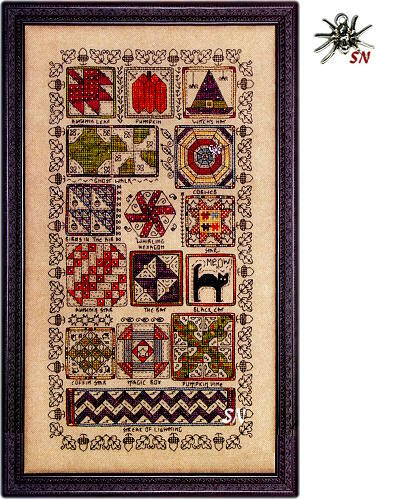 Offered as a leaflet -- stitch count of the main piece is 170 x 187. 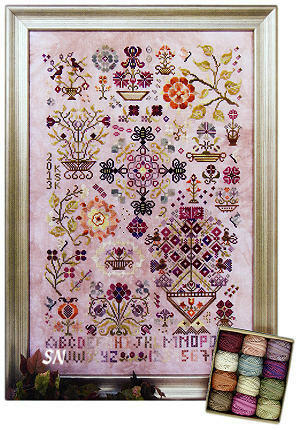 This is a stunning set of floral designs -- stitched in Valdani 6-strand hand-dyed silks!!! 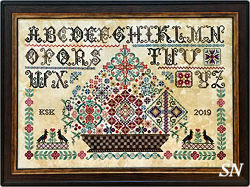 Inspired by the many flower motifs in the old English samplers, Karen has designed a smaller 4 x 9 Guest Room greeting as well as a larger 11 x 13 sampler that would be awesome hung in the same room! Offered as a leaflet this comes with the 6-ball collection of the hand-dyed silks, and is NOT coded for DMC or any other thread. Washed Cinnamon, Tea Honey, Golden Moss, Blue Lavender, Teal Smoke, and Nostalgic Rose are the featured colors and they are just yummy! Several different shades in each little ball of the silk, I don't know what is prettier part -- the design or the threads!!! Just so much to look at, this is charming! Stitched on 32ct Platinum Belfast linen, it'll finish approx 18 x 11. What a neat thing for a gardener in your life! Rosewood Manor has a new sampler that is full of Autumn color and Halloween attitude! 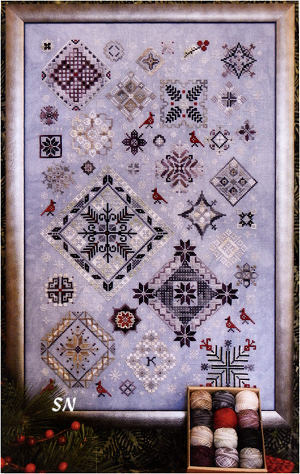 All tucked inside her Blackwork border of acorns, you'll find 15 different quilt blocks worked with 8 different shades of Weeks overdyeds. Amber, Eggplant, Lancaster Red, Moss, Sweet Potato, Teal Frost (retired color! 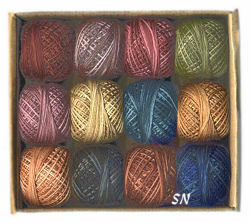 ), Indian Summer and Swamp Water... pull them out of your stash... a gorgeous collection of color! Finishing approx 7 x 14 (not too big at all! ), the leaflet comes with a stunningly REAL looking sterling spider charm that is featured on the Cobweb square of the sampler. If that little guy showed up live and in person on my wall, I'd be freaked out!!! Offered as a leaflet with Mr. Scary Spider charm, this is a fun diversion from classic Halloween... into traditional quilt motifs! What a pretty antique-y-feeling piece! 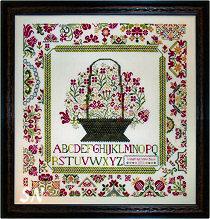 A delicate floral basket beneath a very Victorian alphabet... the fabric is of special note with this piece. See the 'wallpaper lines' in the background??? THAT is printed very lightly on the 28ct Antique White Surrey Fabric specially made JUST for this particular piece! 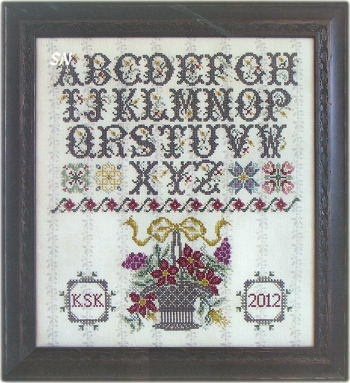 This main design finishes approx 12 x 12 and is stitched with regular DMC floss. The fabric features those pale motifs for your background that add such a flavor! Charming! 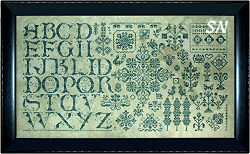 Offered as the leaflet (you can stitch this on any fabric you like..) with this awesome Surrey Fabric offered separately. 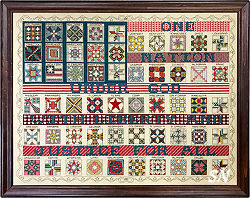 Rosewood Manor has several new releases, and this one, Old Glory, is one of my favorites! 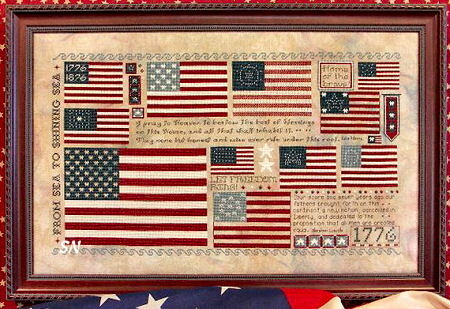 A medley of the different American Flags through the years, Karen has them all together, along with a bit of history about each. 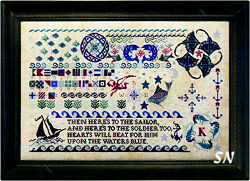 If you stitch the whole piece like it is here, it'll measure approx 11 x 20 on 32ct. It's stitched in plain 'ol DMC floss -- you'll need 16 skeins total of only 5 colors: 221, 712, 924, 926 and 3799. 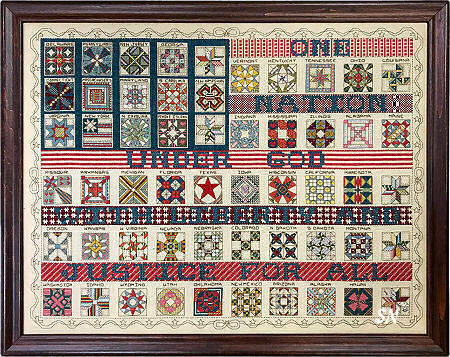 Rhodes and Eyelets, Smyrnas and Diamond Stars, along with LOTS of Cross Stitch, this is truly a piece to teach American History! Offered as a leaflet. WOW... this is SO cool! 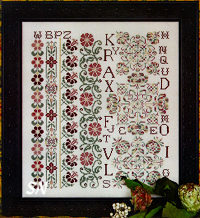 This is a booklet stuffed FULL of pretty Bargello variations that Karen as organized into a Random Spot Motif Sampler. Very different in the world of samplers, this really IS a sampling of stitches. Bargello looks hard to stitch, but it's really easy. 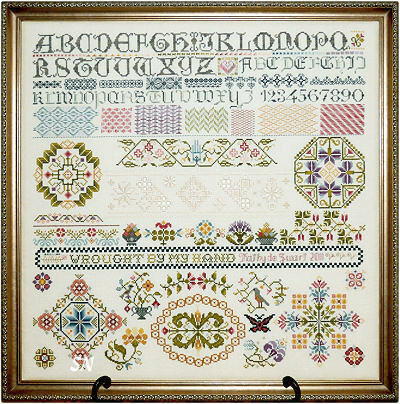 It is simply Straight or Satin Stitches all lined up next to each other, with your color variations making up as much of the design impact as the stitch placements themselves. Bargello isn't as good without the color stripes -- you want it to *move! * I tried to design Bargello *once* and gave up! It's harder for a designer to create than it looks, so I really appreciate this publication. 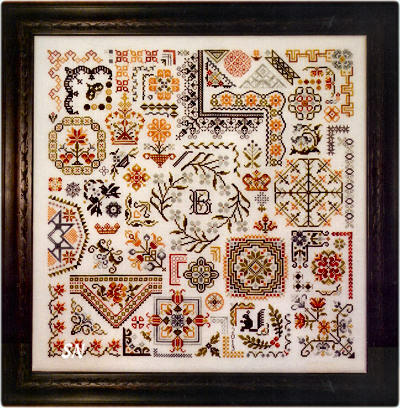 It's like a miniature handbook of 37 different motifs!!!!! 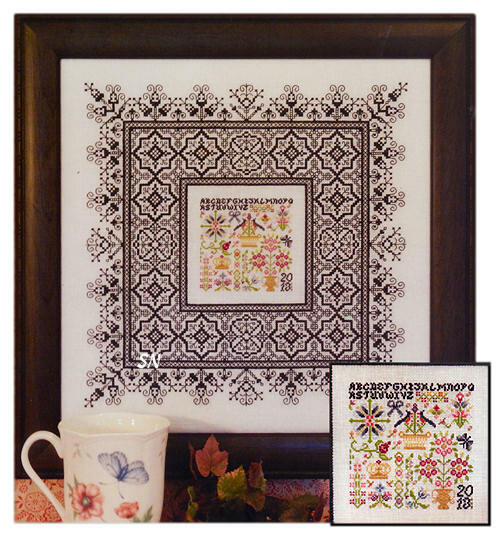 Just beautifully done, you can change any colors in any of the motifs if you want. 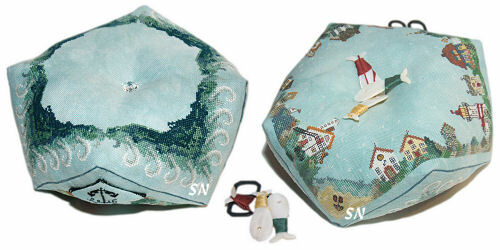 THIS is what you used to see on antique foot stools, and still do on eyeglass cover and that sort of thing. 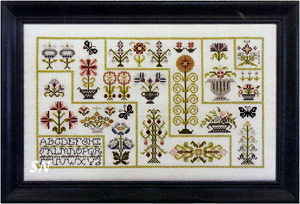 This sampler measures approx 7 x 13 on 28ct Ivory Cashel Linen. Coded for DMC, you really don't want to use hand-dyed instead, because you need the individual rows of colors to be distinct from each other. Just use good old DMC! Pick your favorites and make some little fobs or ornaments -- or get ambitious and do this whole thing. It's a show-stopper! The leaflet makes an excellent reference tool! 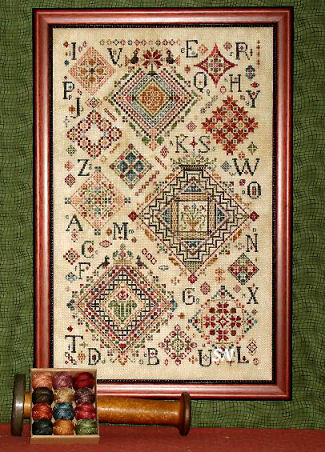 Inspired by the lovely Baltimore Quilt Album quilts, Karen has designed one for Cross Stitch (and stitched it) because she doesn't have time to quilt!!!!!! Traditional, lovely flowing blocks... all organized, traditional colors, everything about this is pretty. 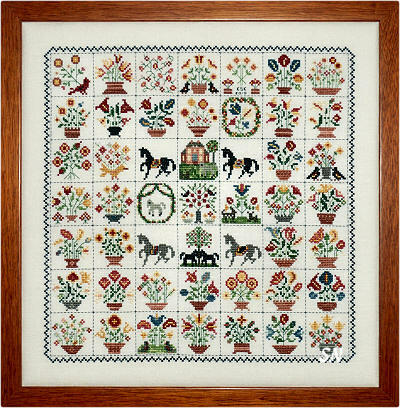 Each of the squares is charted on its own page, and there is a huge 17 x 22 inch 4-page pull-out master chart that shows the border chart and block placement. 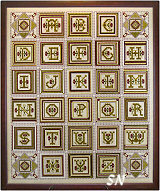 Charted for DMC, the main piece measures approx 20 x 26 on 28ct, while each individual block comes in at 5 x 5. Beautiful! 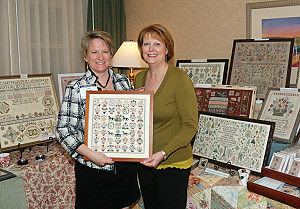 Karen found an antique quilt dated 1830, with Adam and Eve in the Garden of Eden. So... not being a quilter... she designed and stitched it instead! (probably saves time!) This is a beautifully delicate and flowing piece, I can just imagine if the original quilt was applique! 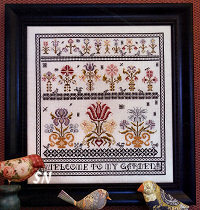 The Adam and Eve design element seems to be toned down somewhat -- so Karen adds an option to stitch 'Welcome to My Garden' instead of the Garden of Eden block, and I don't see a serpent anywhere... just lots of butterflies and gorgeous florals. 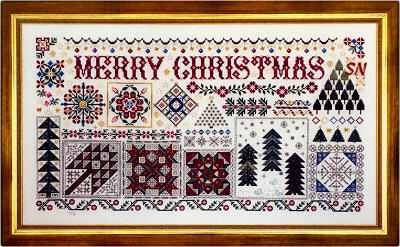 Another awesome Rosewood Manor creation, FULL of colorful stitching details, pretty motifs, and LOTS of possibilities! Stitched on 28ct Cream Cashel Linen in mainly DMC flosses, the entire piece finishes approx 20 x 20. Karen always tells you to be creative and split the whole thing up into all the smaller bits. 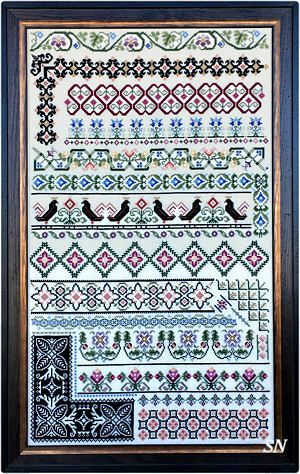 Check out all her Blackwork panels, all the Darning Stitches, the Quaker motifs, the Hardanger in the center, and all the pretty floral bands and motifs. You could do cushions, ornaments, basket bands, all kinds of cool stuff! Anyway, this is really a very pretty piece -- great balance, lots of color, very eye-catching! Offered as the leaflet. Here's a medley of different keys! Charted for either a black presentation on 30ct Weeks Parchment, featuring black seed beads, or metallic keys on Creme, you'll get a totally different look depending on your color choice. Karen talks about ideas for her keys: inserts for key racks, or trays to hold keys, a *welcome here* hook to hold incoming key rings, New Home/Housewarming idea -- frame the key to the first house, frame the key for the new business, first car key... old keys have charm... Key to My Heart... lots of possibilities with this one! 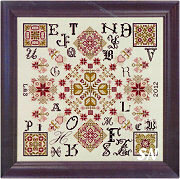 Offered as a leaflet, main sampler finishes approx 10 x 10 on 28ct. Wow... we like this one... every square IS different!!! If you work the whole thing, it measures 183 stitches square. 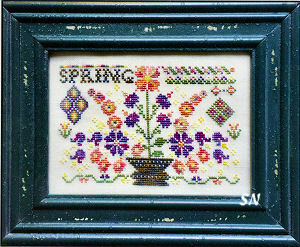 Each tiny square is only 25 x 25 stitches -- you can do a lot with tiny motifs like this! 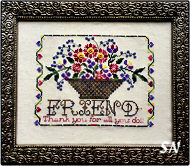 Karen offers lots of 'frame' options -- extra stitched borders for the squares along with arrangement ideas. Stitched in regular DMC flosses -- 29 different colors! 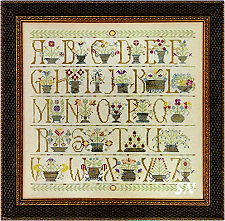 Rosewood Manor has a new sampler full of Springtime florals -- but Quaker-Inspired! Choose just your favorite flowers and make them into ornaments or fobs, or stitch the whole, and hang it in your garden room! Charted for RM's new set of Valdani's 3-Strand flosses... there are no DMC conversions offered... so if you want to use overdyeds from your stash, you get to be a little creative with color! 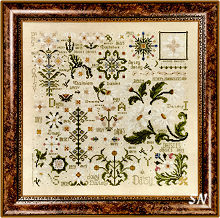 Lots of pretty motifs in here, the main piece finishes approx 12 x 19 on 28ct. 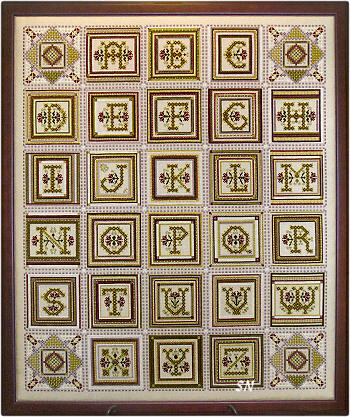 Rosewood had designed an alphabet of block capitals, each surrounded by rows and rows of special stitches in it's 5 x 5 square. You can choose your letter, and next, go shopping through the book for your border! 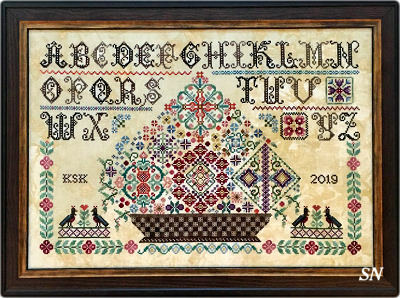 Smyrnas, Rice, Leviathans, Klosters, Algerian Eyelets, Mosaics, Herringbone, and of course a few X's... this is a lovely collection of letters and small borders. You could stitch the entire alphabet, but that seems extreme for most! Just choose an initial or two! Rosewood Manor has a *really cool* new Biscornu-shaped seaside village... houses and businesses on one side, and the mad, churning waves gracing the other! Stitched on 32ct light blue linen... each building that goes around the whole piece is unique, and full of lots of tiny details. Lighthouses, shops, cottages, hotels, a market, City Hall, the boathouse, schools and churches... just charming! They are on the top side. The bottom is a brilliant medley of rolling waves, so full of color and motion. Simply stitch both sides, and hand-attach together to make your 8-ish inch cushion! I've not seen anything like this, so it has been endearing. Karen shows some wrapped fish thread winders tossed into the center cavity, just for decoration. Offered as a leaflet with huge charts and great assembly instructions! Just an awesome sit-about! 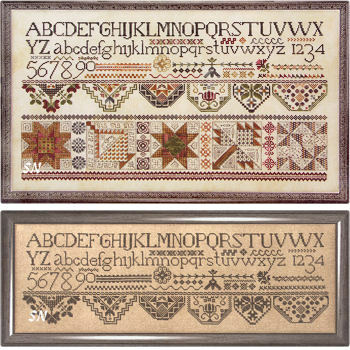 Rosewood Manor has a new Quaker-inspired sampler that is full of diagonal, lacy features. 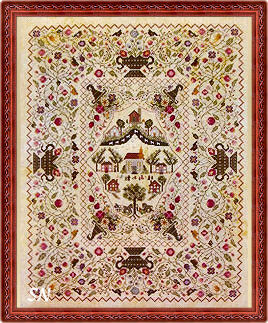 Stitched with the SAME color palette of Valdani hand-dyed flosses as Quakers and Quilts, this finishes approx 12 x 19; it's quite large, and full of details and vibrant color. Just x's... this is very elegant... and a fun way to use the 3-strand Valdani overdyeds! Offered as a chart. 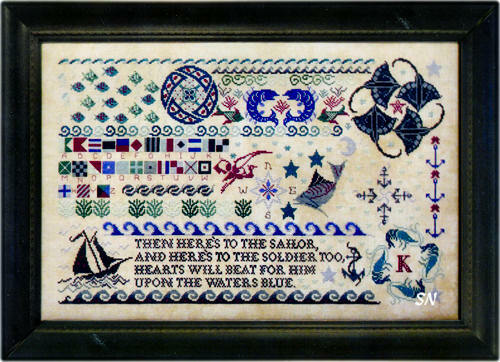 This is a cool 14 x 16 piece... you can stitch it just as it is... or take specific motifs out of it and make smaller samplers, or add little ships to other designs you already have! 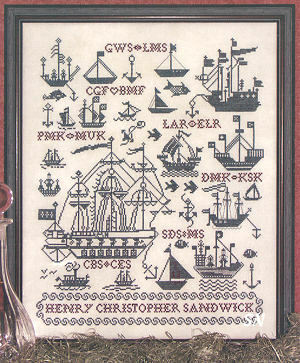 Karen Kluba has lots of different ideas for this medley of sailing ships... she has initials in here to signify weddings -- kind of like a family tree. 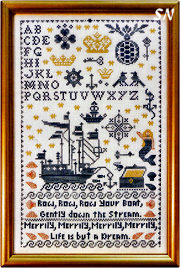 You can use waste canvas and stitch ships and anchors on napkins and placemats for your 'luxury yacht'... or lake house! 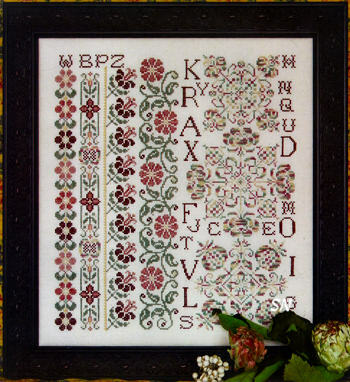 Inspired by their beauty, and the messages flowers send to all, Rosewood Manor's Karen Kluba has designed an awesome random spot motif sampler that lists all sorts of different flowers -- along with their specific meanings! During Victorian times, small bouquets -- Tussie-Mussies -- were given as gifts, usually with secret messages hidden inside! Definitely a quicker way to communicate to your secret love than stitching this piece... THIS is much longer lasting!!! 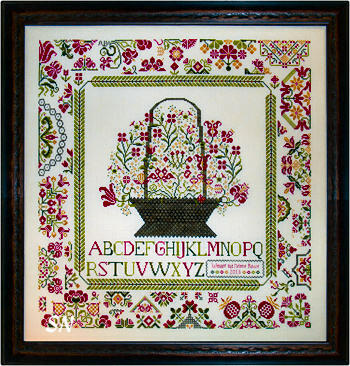 Offered as a leaflet, there are flower motifs for each letter of the alphabet, and loads of floral urns and tiny individual motifs. As with all of Karen's patterns, you can pull out small designs, stitching them into pin cushions or fobs -- really just anything. Coded for DMC flosses, the main piece finishes approx 18-1/2 inches square on 28ct! Just lovely, like the real things, your floral garden is delicate, lacy, charming, and speaks volumes!!! This is a really cool 3-part piece... I didn't realize its versatility, till I saw the monochromatic Quaker half pictured on the booklet's back cover. Look carefully... the top third is a simple alphabet which would be pretty all by itself. 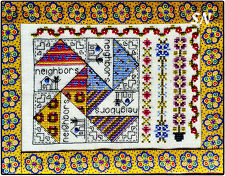 Next, add the row of Quaker motifs. Stunning... you even have enough information in the charts to duplicate the missing tops in case you want just that row! Finally, finish off with the intricate row of quilt blocks! Each one of those in incredible just by itself... but put them together, and wow! One of Karen's trademarks is all her extra 'Bonus Charts' scattered throughout her patterns, this one being no different. 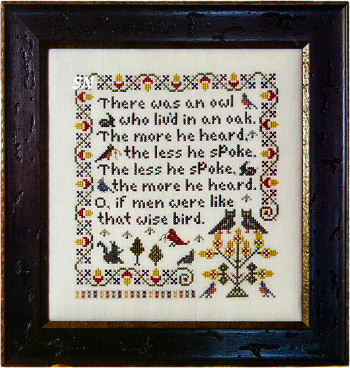 You get smaller Quaker samplers, more little borders, and all sorts of project ideas for needlecases, etc. The entire piece measures 19 x 10 on 32ct, so its quite generous in size. Just stunning! Rosewood Manor has also packaged up the Valdani threads for this remarkable design, and we now have them available for you, too. Rosewood Manor's Karen Kluba has designed another awesome medley of flora and fauna! 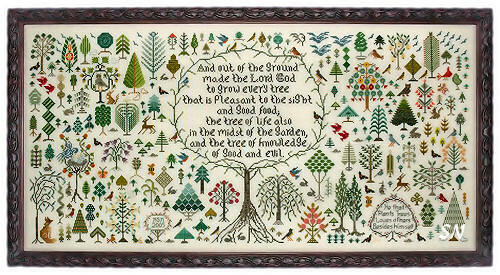 A companion of sorts to 'And a Forest Grew' this piece celebrates everything that grows and lives in your garden!!! In paging through the book, I found 12 different little creatures -- birds, bunnies, bugs, even a hedgehog -- all hidden among the pots, urns, and vases of blooming flowers. 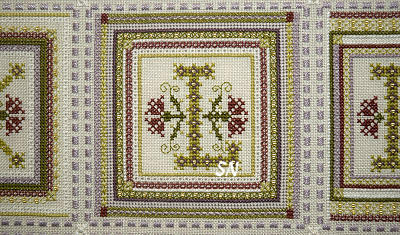 Finishing an impressive 18 x 18 on 32ct, this is coded for DMC or Anchor floss, and uses crosses, back stitch and a few Algerian Eyelets. Stuffed full of detail, color and charm, the book also offers lots of smaller 'out-takes' from the main design to create pin cushions, fobs, needlebooks, smaller samplers, just all kinds of things. 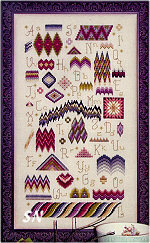 There is so much you can do with a pattern like this... it's just so much fun paging through it! 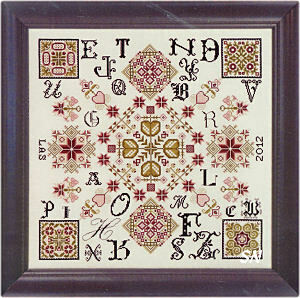 A complete alphabet is also provided to personalize anything you want. The featured verse is from Henry Ward Beecher; 'Flowers are the sweetest things God ever made, and forgot to put a soul into.' So... check that thread stash... you'll need 120 different colors for this one! Seasons of the TreesSpring, Summer, Autumn, Winter... see all the trees -- their many greens and browns -- throughout the seasons... Spring at the left... flowing into Winter at the right. Rosewood Manor's Karen Kluba has a real talent for her trees, her lacy motifs, her full, balanced, busy and intriguing designs! You can study her things over and over again, and each time, you're treated to some new little detail tucked somewhere in there! Seasons of the Trees is no different! Offered as a leaflet, this is stitched on 28ct and measures a generous 11 x 18. Worked with regular DMC flosses... you'll use 48 of them from your stash! 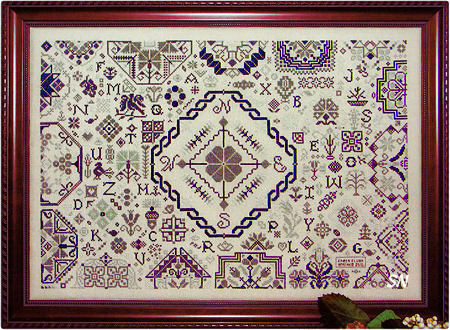 Her charts are huge... and best of all... in paging through the leaflet, I find 14 BONUS charts... little (and some a bit larger) take-outs from the main design that are suitable for needle books, ornaments, fobs, and mini-samplers! There is so much in here... if you like this one, check out 'And a Forest Grew' and the two Christmas Stockings -- Cranberries and Pines! Really unique, definitely worth your stitching time! What an understatement!!! Karen Kluba of Rosewood Manor has outdone herself with this breathtaking piece! Offered as a leaflet, you'll find 30 pages of the main chart split up into smaller sections -- to fit the pages, and make stitching easier. Worked entirely in 32 colors of DMC flosses, this measures approx 14 x 18 on 32ct. Along with the main sampler piece, there are all sorts of smaller charts included for two scissor fobs, a needlebook, mini-sampler, a larger floral bouquet piece, as well as the tiny charts of one-over-one detail in the main piece. So pretty and colorful, so delicate and intricate, there is so much to see in here, it's one that you keep paging and paging through. Execute the Double Running Stitch instead of Backstitch in this piece... it will save lots of thread and make the backside of the needlework lovely! You have lots of fabric options with this... even count! The 32ct Moonglow called for by Picture This Plus comes in a 1/4-yard piece (24.00) -- but that gives you only 2 inches of extra fabric on each side... the 1/2 yard piece ($48.00) is twice the price... the 28ct Moonglow ($48.00) would require the 1/2 yard piece... we have lots of other 32 and 28s (in the price range of $21.60), too!!! You can tell us what you'd like in the comments box of the order form or give us a call, and we'll help you choose. Ok... pull out your DMC floss... this awesome piece uses no less than 100 of them!!! 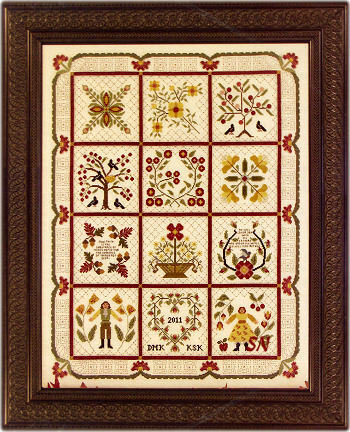 Every green you can imagine... lots of chestnuts, butterscotch, and terra cotta earth tones, this sampler is delightful to look at! 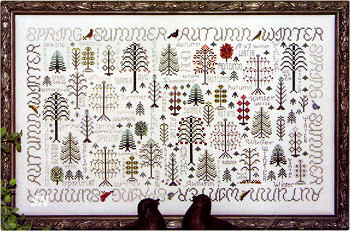 Karen, the designer, says she was researching trees for samplers, and found so many different ones... that 'A Forest Grew!' Filled with so many charming details of tiny forest wildlife, and delicate, lacy trees, you just keep looking at this and finding something new all the time. Stitched on 32ct Cream Belfast Linen, this finishes an impressive 26 x 12-1/2. There are several ideas and smaller charts included to help you pull out little bits here and there, to add to a needle case somewhere, or create some bands for another sampler. So different, such pretty balance with the sizes, colors and detail! Offered as a leaflet. Need floss? Check your stash first! Need Linen? On 32ct... you'll need 19 x 32. On 28ct ... you'll need 20 x 36. We can provide you those cuts, or 'Fat Half Yards' which measure 27 x 36... giving you enough extra linen for a couple of ornaments, pin cushions or needlecases -- in a matching fabric dye lot. Study the pattern and then decide! 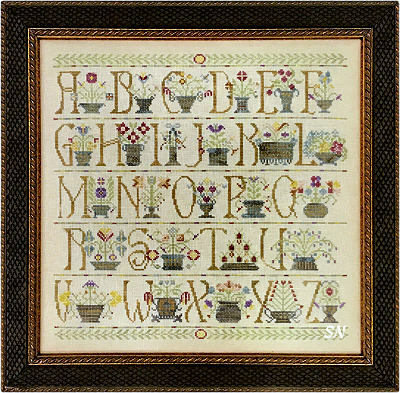 All the Flowers of Tomorrow are in the Seeds of Today is the verse in this lovely piece, that is a generous collection of alphabets and floral vases!! 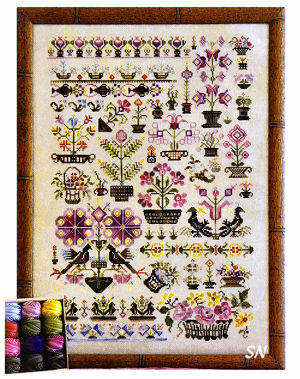 Check out all those delightfully different little floral motifs in this! There are 36 different ones in just two rows... how cool if you need one for another piece, a needlecase or scissor fob? Offered as a leaflet and charted in regular DMC flosses... overdyeds would be awesome in this. Finishes approx 31 x 14 on 32ct -- Huge, actually!!! Its very pretty.